If you are ready to be motivated, inspired and organized in 2018, then you are ready to purchase Whose Shoes Are You Wearing 2018 Transformational Planner. Featured in the book for the month of November, Attorney Evans shares her entrepreneurship journey, successes and obstacles. 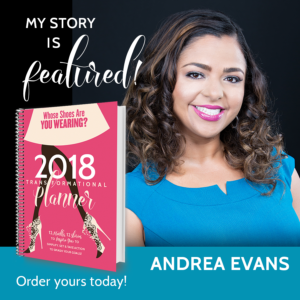 Learn from Attorney Evans and 11 other women whose stories are sure to keep you on track in 2018.